One of the latest programs that has been launched to create and copy optical discs is Hamster Free Burning Studio. It is a very dynamic program with a very clear interface from which it will be possible to create all kinds of optical discs and ISO images. Using this software is very easy, making it a very good selection for those users that are less used to working with the computer. 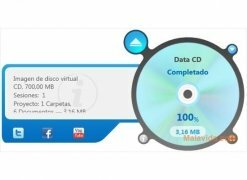 From a rather minimalistic interface, in which only the options can be seen, it offers the possibility to be able to create a data CD/DVD or copy a disc that already exists (the software has other options that are still not available). Once you have selected the option that you want, the program will open an interface that occupies the full screen from which you will be able to select the elements that you want to burn on the optical disc or from where you want to copy. As well as optical discs, Hamster Free Burning Studio also allows the possibility to create ISO images with the selected data, making it a lot easier to transport them without having to resort to the use of a disc. Therefore, if you want an application that will allow you to create your own optical discs and copy those that you already own, download and install Hamster Free Burning Studio, it is free.